It was thrilling to learn how to drive again at the Kessler Institute for Rehabilitation in West Orange, New Jersey, this past June. 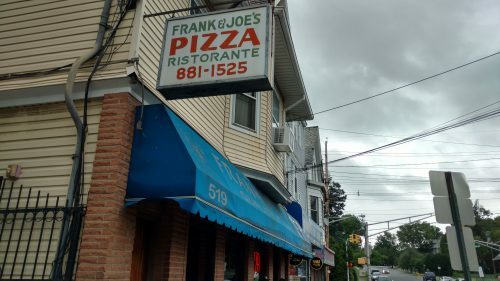 But almost equally exciting was finding out that my instructor Maria’s father ran a pizza place in Paterson. I promised myself that when I was finally an approved driver, with hand controls installed on my 2011 Toyota Corolla, I’d make the half-hour trip to Frank & Joe’s. On October 1, I fulfilled that second vow. It was another overcast day in Paterson, which somehow felt appropriate. 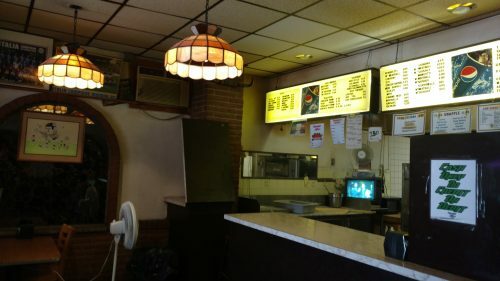 As during my previous visit, Frank & Joe’s was dimly lit during the lunch hour, with only 3 of 10 overhead fixtures on. 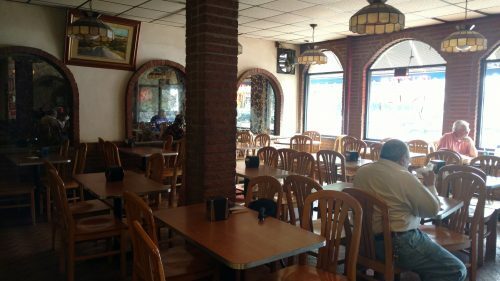 There were a scattering of regulars on hand, including a mustachioed cop in the corner. 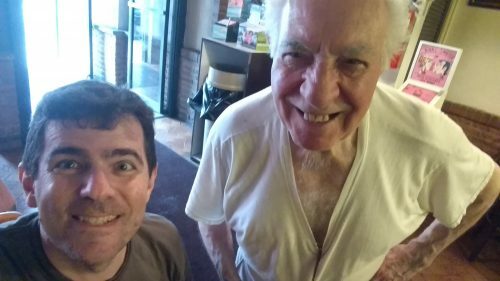 Frank was very happy to see me again — the feeling was mutual — and when taking my meatball sandwich order, asked if I wanted cheese on top. (He made a sprinkling motion with his hand.) “Of course,” I replied. A short while later, Frank brought me a true thing of beauty. As it had come directly from the oven, I let the sandwich cool for just a moment. (I’ve burnt the roof of my mouth once too often in pizza places.) 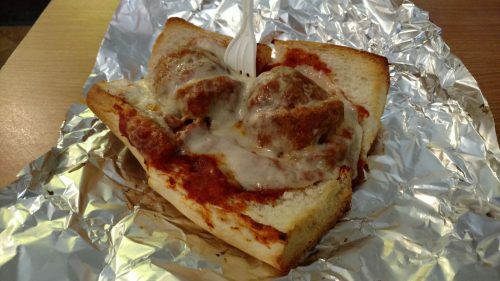 With one bite, I knew this was a superb meatball hero. The roll was crisp and just slightly browned. The meat was clearly fresh but cooked enough to hold together. The red sauce is rich, smoky, and garlic-infused. And the mozzarella lovingly clung to the meatballs without overwhelming them. Hot and delicious, each bite was a genuine pleasure. With the plastic fork I scooped up any stray meat and sauce that had briefly escaped. Fully satisfied, I asked Frank what his other favorites were on the menu. “Lasagna,” was the first thing that came to his mind. My eyes lit up, and I vowed to return yet again.